Welcome back Supernatural and welcome back Cole but a not so warm welcome to the insidious Khan Worms. It’s been about 4 years since we’ve seen them and they’re as creepy as ever. 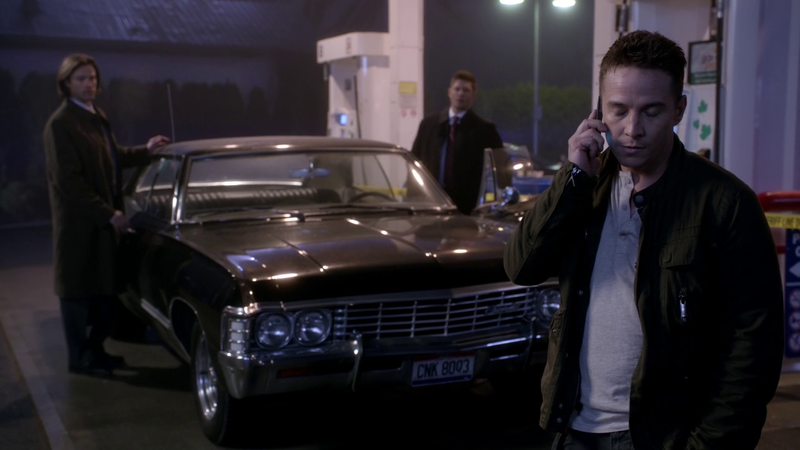 Since Supernatural has been running for such a long time it does have a rogues gallery to call its own that can be called upon whenever the situation needs it. An assumption can be made that the audience will already know what they’re facing and more time can be spent developing the characters and furthering the plot lines. This is exactly what happens here in regards to Cole who makes a welcome return to the show in this episode. Cole has an interesting history already after being one of the innocent bystanders to Dean’s dispatching of a demon some years ago but not understanding what was going on. He had no knowledge of the supernatural aspects of the world so simply assumed that Dean had murdered his father. Some time and knowledge has allowed him to better come to terms with what really happened and actually channel that into something worthwhile. Cole’s service in the military instantly allows the character to hold his own in a fight as well as provide a formidable presence alongside the massively experienced Winchester brothers. Basically he’s the perfect recurring character and should prove to be an effective ally and foil for the brothers. On the subject of being a foil Cole does a great job of that. After learning the truth about what goes bump in the night he hasn’t become a devoted slave of the hunter lifestyle. It’s important that he doesn’t follow in their footsteps because he can serve as a reminder that there is something else out there and that there is more to life than hunting. More to the point Cole reminds Sam and Dean that they can actually try to save people instead of killing the creature by killing the host. It’s an important lesson that needs relearned since their methodology has been a lot more brutal of late. I actually can’t remember the last time they managed to exorcise a demon for instance. It’s something that they really need to get back to so I’m glad that attention has been drawn to it here. It was a simple thing from Cole’s point of view since it was his friend that was possessed and needed to be saved. As far as Cole was concerned killing wasn’t an option here. It’s great to see someone stand up to Sam and Dean for once and it’s even better to see them put in their place when it comes to how they do things. They have their methods but they are imperfect and deserve to be challenged. I found it interesting and really unexpected that Cole’s friend Kit ended up dying despite their best efforts. It would have been easy for their attempt to save him to succeed and have Cole proven completely right about their methods being a little too cavalier lately but the episode didn’t give us this happy ending. Kit’s death was important in many ways as it teaches everyone a lesson. Cole learns that despite the best of intentions not everyone can be saved. It’s a simple fact of life but it doesn’t make things any easier. In a lot of ways Cole must have been expecting that due to his experience in Iraq but I got the impression that he really needed to save this one. It seems that he’s lost an awful lot in life and really wanted to win for a change. It’s also important for Sam and Dean who remember that not everyone can be saved no matter what steps are taken to accomplish that. Despite that loss the important thing is that it’s never a waste of time to try. They did everything they could and were unlucky this time but next time might be different. Both characters need to get back to something resembling humanity and this episode is an important step in that journey. Sam’s reaction was especially powerful as he felt personally responsible for failing in this case and really beats himself up about it. It appears that Sam allowed himself to feel compassion and it really came back to bite him. Travis Aaron Wade has such natural chemistry with both Jensen Ackles and Jared Padalecki but it’s the scenes between Cole and Dean that are the most memorable. Cole still doesn’t like Dean but has come to terms with the fact that Dean didn’t kill his father. The thing he seems more annoyed about is that Dean made no attempt to save him as far as he knows and this probably informs much of what went on here. Cole isn’t stupid but he thinks life is important and therefore should be respected when it is endangered. He ultimately joined the military to help people and wants to continue doing so here. Cole being infected by the Khan Worm was an effective device to reinforce the troubled relationship he has with Dean. Any feelings of guilt that Dean had over not being able to save his father are able to be explored here as he has the chance to make up for that slightly by making sure Cole gets out of this alive. There’s also a poetry to the idea that Cole is willing to let Dean be the one to kill him if it comes down to it. He’s not ignorant to the risks and takes some kind of solace in knowing that Dean will do what is necessary should it come to it. I like the fact that Cole wants to go back to his wife and child instead of pursuing the same lifestyle as Sam and Dean. He is able to distance himself from it and take stock of his real responsibilities. It’s not that he doesn’t care about the mess the world is in he has just decided that his priorities are his own corner of it. After seeing so many hunters on this show it’s refreshing to see someone who knows what goes on but doesn’t want to be a part of it. I liked the military angle here and how the behaviour of the former soldiers was basically written off as a form of PTSD then dismissed. Of course the Khan Worms were used as a metaphor for that and the title is in reference to what people bring back from War psychologically speaking. They ultimately become an interesting representation of the inner demons that many soldiers carry with them long after the fighting stops. The Mark of Cain was only really mentioned to remind us that it’s still around and still part of everything. There’s a brief discussion where Sam and Dean are honest with one another about the chances of finding a cure. They’ve looked everywhere twice and haven’t found anything so it could just mean that there’s nothing to be found. Dean wants to get back to doing what they do best and wants his brother by his side to keep him right just like old times. The incident with the Khan Worms also serves as a painful reminder that it might not be possible to save Dean in this case. As far as Dean’s concerned it’s the attempt that’s important and not the actual success. On the subject of old times, this seems to be a theme that is permeating the show of late. In the last few episodes there’s a massive emphasis on getting back to basics. The larger story that involves Castiel and Crowley is still around but it’s very much on the back burner for now. When they do appear it mostly serves the plot focused on the Winchesters. As much as I like Crowley and Castiel I was feeling that the show was becoming about those characters when it’s supposed to be about the brothers. That’s not something I really liked so it’s great to see the show returning to a focus on the characters that started it all off. I like that they’re going back to saving people and hunting things and I hope this carries on for a while. The Mark of Cain is enough to sustain me as an arc for now so let’s keep this strong run of episodes going. Very few missteps in this one other than some really bizarrely idiotic supporting characters. When Sam and Dean questioned the wife of the first victim and it didn’t seem to occur to her that her husband drinking bath water was something that was abnormal until it was brought up. It just seemed like an obvious attempt to provide the audience with exposition that really wasn’t needed. 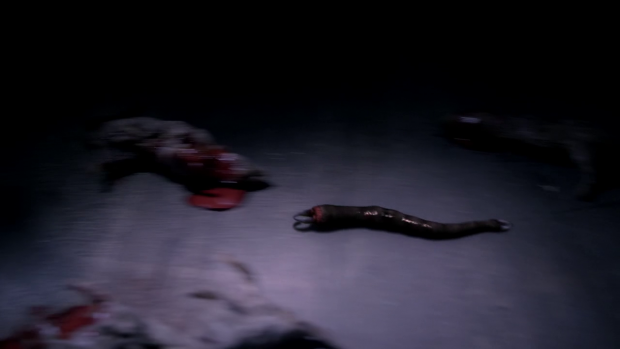 I’m also confused as to why Dean wouldn’t tie Cole up immediately when trying to get rid of the Khan Worm. He’s not that stupid and not that sloppy. He didn’t even do it after Cole tried to attack him. It was probably an attempt to manufacture drama but there was plenty of that. A really strong return for Supernatural and a really well told story that provides some interesting development for those involved. The return of Cole and seeing where he has gotten to since we last saw him is really interesting. He has come to terms with all the weird stuff in the world but hasn’t become obsessed with the hunter lifestyle. It’s a refreshing change to see someone in the know on this show who chooses to use that knowledge to protect the ones he loves. His wife and child are important to him and all thoughts are focused on getting back to them. Cole’s presence in the episode serves an important presence in terms of giving Sam and Dean a slap in the face. Sam and Dean have been a little too quick to kill a demon by sacrificing the host rather than taking the time to save the life affected. It’s something that they’ve gotten too comfortable with so it’s good that Cole reminds them that human life is important and some effort should be made to preserve it. Surprisingly this episode doesn’t give us the happy ending and provides important lessons for all concerned. Sam and Dean are reminded that not everyone can be saved despite their best efforts and Dean especially is reminded that the attempt is the thing that matters. Cole learns the same thing but I got the impression that he really needed this win on a psychological level. The scenes between Dean and Cole are among the strongest here with the two characters having a grudging respect for one another. Dean wants to make up for not trying to save Cole’s father all those years before and Cole respects Dean enough to let him be the one to kill him if the infection runs its course. It’s really promising that this episode continues the theme of returning the show to something resembling its routes. It’s becoming about two brothers traveling around to stop supernatural threats with some arc stuff going on in the background again. This is something that is very welcomed by me as I felt there was a little too much emphasis on the world ending threats up to now. It’s good to go back to what made me love the show in the first place. There were a couple of missteps like stupidity from the supporting characters and Dean acting a little too sloppy in dealing with Cole but these are really minor niggles. Let’s hope this strong run of episodes continues.